“Our education system is in desperate need of repair, reform and reinvestment,” Gov. Kate Brown said Monday during her State of the State address. 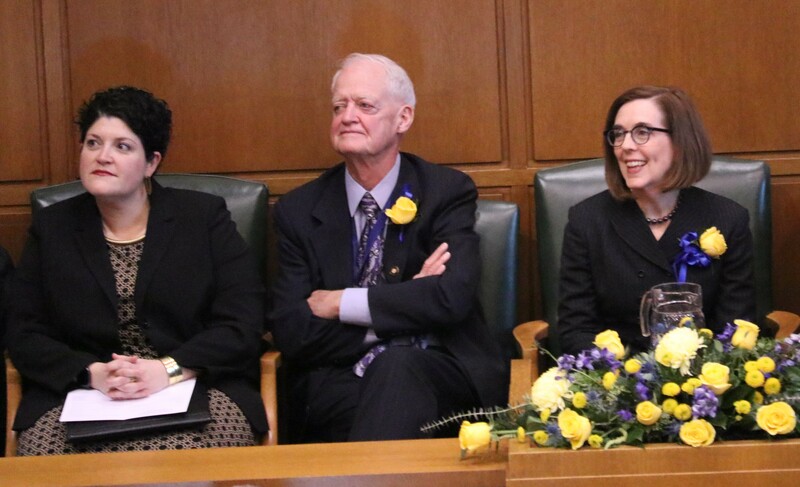 Brown took the oath of office for her first full term on Monday in the Oregon House chamber in front of a joint meeting of the Legislature, judges and state dignitaries. Brown became governor in 2015 after Gov. John Kitzhaber resigned, and she won a special election in 2016 to finish out his term. Brown said Oregon had not significantly increased per-pupil spending since the early 1990s, and she compared the Oregon education system to an old house that hasn’t been maintained. “The longer we wait, the more it will cost to fix it,” she said. She vowed to work with the Legislature, business community, teachers and parents to fund K-12 schools at a level that ensures school districts won’t need to make cuts. She said the current economy offered a chance to address persistent education system problems but the state needs to act now. Brown’s November budget proposed $8.97 billion for the 2019-21 State School Fund. The Oregon Association of School Business Officials calculated school districts would need $9.13 billion to maintain current service levels. Brown proposed an additional $1.3 billion for early learning and K-12 education. She said new funds would be audited to hold school districts accountable and reassure taxpayers. Brown reiterated goals laid out in her budget: Fund 10,000 more early education spots, reduce class sizes and increase the length of the school year. Brown also expressed a need to invest in career and technical education, stabilize Public Employees Retirement System rates for schools, make higher education affordable, close the opportunity gap and help rural schools. The governor’s speech underlined the crowded docket for the 2019 Legislature, laying out priorities that included voting rights, campaign finance reforms, affordable health care and housing, family leave, and environmentalism.